Optional: Pet liner available at your local pet store. Approximate size is 20" x 14 1/2". If desired, make a cover for it. From 5/8" FF cut 9 spokes each 8" long and 43 spokes each 10" long. Mark the center of your base (10"). If the groove in your base is too narrow to insert the spokes, run sandpaper around the groove several times, and/or sand down the ends of each spoke (you want a tight fit). Insert (1) 8" spoke at this center mark and then 4 spokes on each side of the center spoke (for a total of 9 spokes). This will be the front of the basket. Next insert all (43) 10" spokes, spacing them evenly around the base. Weave 1 row 11/64" FO starting on top of the center spoke. Keep the spokes flat and weave in 2nd row. Gently upset the spokes and weave 3 more rows (total of 5 rows of 11/64" FO). Weave 7 rows start and stop with 3/8" FF. You are now ready to gradually increase the height of the sides and back of the basket. You will NOT be weaving the front 9 spokes. Put clamps or twist ties to indicate that these are your front 9 spokes. Start the increase with 3/8" FF on the 5th spoke to the right of the center spoke. Leave a 4" tail and bend it back inside the basket, tucking it behind the 3rd spoke. Weave around to the opposite side, ending as you began. Remember, do not weave the front 9 spokes. Moving up a spoke, repeat the same procedure for 3 more rows (for a total of 4 "step ups"). Note: the front will have 7 rows of 3/8" FF and the back will have 11 rows. Weave in a rim row of 3/8' FF wedging it down into the gaps on the sloping sides. Pack well. Cut and tuck spokes. Soak the 5/8" FO in warm water to help soften it. Rim with 5/8" FO inside and outside with seagrass between rims. Lash with 3/16" FO. Patience is needed with this rim. Helpful Hint: I found I could "mold" the rim to the sloping sides of the basket a bit easier by keeping the 5/8" FO wet. Another option is to use 5/8" FF as the rims, but the basket will not have the same strength at the top as with 5/8" FO. 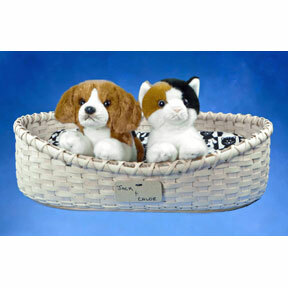 Using a fine felt tip pen, write your pet's name on the stoneware name tage and attach with ribbon. All materials (except ribbon) to make this basket are available at NC Basket Works.